JANESVILLE—There is no river of chocolate flowing through Impact Confection’s candy factory on Janesville’s north side. And no army of small men perform choreographed songs to warn against the dangers of gluttony, greed, television and consuming too much chewing gum. But inside the walls of Impact Confections are conveyors that carry thousands of brightly-colored, sour candy gummy worms. The worms shimmy and shake their way through hundreds of yards of machinery staffed by dozens of workers in white lab coats. And that’s just one of more than a dozen types of candies Impact makes at a production facility that’s like no other in Janesville. Impact houses its production floor—and since late last year, its corporate headquarters—in a 180,000 square-foot facility it’s operated at 4017 Whitney Way since 2011. During a recent tour, plant Manager Barb Estervig told The Gazette that Impact is seeing a boom in demand for candies it produces and plans to meet it head-on. Estervig said Impact Confections candy making production is due for an expansion in equipment and candy handling rooms later this year or early in 2017. That will gear up the company to nearly double candy production in Janesville. Impact was formed in a 1981 in a residential kitchen in Roswell, New Mexico, initially as a specialty lollipop maker. The company grew from there to become a major candy producer. Impact’s biggest move came in 2004 with its purchase of Warheads candy, a brand that produces several lines of tart and extremely sour candies made in flavor intensities that range in sourness from tart to so-sour-you’ll-break-into-a-cold-sweat. In 2004, Impact also bought Melster, a candy producer that had operated in nearby Cambridge since 1919. The two companies relocated production to Janesville in 2011, and production here has grown year over year to meet rising demand in major consumer markets in the U.S., Canada and Australia, Estervig said. 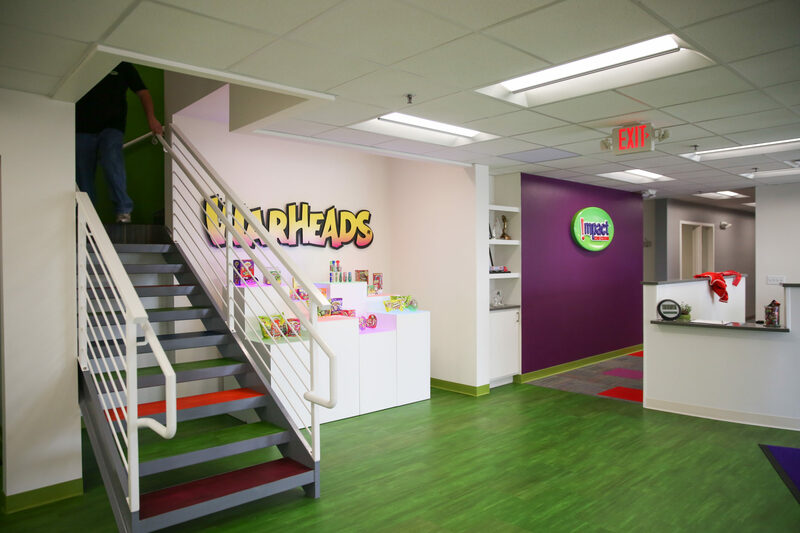 At the end of 2014, Impact moved its corporate headquarters from Colorado to Janesville, where it renovated the business offices and decked out meeting rooms, hallways and even stairwells in Technicolor hues reminiscent of the classic Hasbro board game Candy Land. The offices look out over Impact’s growing production, handling and packaging floor. In Janesville, Impact now employs about 100 full-time, permanent workers and up to 250 seasonal workers. Estervig said the company will be looking to ramp up hiring, although she said she couldn’t say whether the bulk would come through full-time hires or seasonal work. “It’s exciting. We’ve grown like a weed since 2011. We’ve got the space here in Janesville to eventually produce twice what we do, and we’re going to start moving that direction soon,” Estervig said. The company plans to buy a second mogul, a piece of candy making equipment the size of a large truck trailer that injects hand-mixed ingredients into trays full of corn starch that can be stamped into forms to create any shape of candy the company designs. The mogul machine is used to make dozens of types of candies that Impact produces in its on-site kitchens, including sour gummy worms. A second mogul machine would allow Impact to double capacity in Janesville as demand pushes higher. The company could then meet growing demand for candies the company now produces, including, among others, Warheads candies, Melster wrapped saltwater taffy, marshmallow candies and a growing line of seasonal chocolate-coated candies that Impact coproduces under contract for chocolate giant Hershey, Estervig said. As Estervig spoke, hundreds of fresh-made, orange marshmallow circus peanuts poured down a gleaming metal funnel the size and shape of an elephant’s head and trunk and rifled through a conveyor into a machine sealed packages bound for the candy aisles of retail stores. The marshmallow circus peanut has been a staple of mass-production candy for long enough that it has gained status as “heirloom” or “nostalgia” candy. It’s in the same realm as candy wax lips and candy cigarettes. The circus peanut’s curious banana flavor, which is in no way reminiscent of how peanuts taste, is a decades-old enigma and perhaps the greatest selling point of the 2-inch candy. Yet the circus peanut is no punch line at Impact. It’s serious business. In-house subsidiary Melster has made the corn syrup and sugar-based candy peanuts for decades, and Impact now dominates the market share for circus peanuts. All told, the company produces 6 million to 7 million pounds of circus peanuts a year using its candy-stamping mogul machine, Estervig said. Some of the work at Impact, such as the company’s wrapped saltwater taffy, is still done with hints of old-world candy making. “You can’t change some processes much. We still do it the way you see it on done on a carnival midway,” Estervig said. Albeit, on a much grander scale. The taffy-pulling and packing room is manned by at least a half a dozen workers who take warm, freshly mixed flavored taffy and manually stretch it into manhole sized slabs that they pile onto machines that work taffy from loops the size of rolled room carpets down to bite-sized pieces that are auto wrapped in waxy paper, just like at the county fair. Like Impact’s other lines, the taffy is packaged for wholesalers and distributors who supply to large retailers such as Dollar General, Wal-Mart and Target, Estervig said. During the plant tour, workers in Impact’s taffy-pulling room were stretching yard after yard of “Fall Festival” taffy. Behind the room’s thick plastic safety curtains, the air was thick with the smell of pumpkin spice. Estervig said the overriding smell of sugar and confection inside Impact Confections is something most plant workers stop smelling 10 minutes after their shift starts. But for Estervig, those first 10 minutes are a reminder of the sweet industry she works in. Earlier in her career, Estervig had worked at a processing plant that made Goodyear tires. “I can tell you that the smell of fresh pumpkin spice taffy beats the odor of fresh rubber, hands down,” she said. This story originally appeared in the Janesville Gazette. Experience HOTHEADS with a twist!